In comparison to the endless love, self-sacrifice, strength, courage, and devotion our moms have shown us, and instilled in us, this article isn’t much. But maybe you could help us out. Tell us about your moms and role models, on our Instagram or on our Facebook page. Tag the moms in your life that deserve to be recognized! Add your stories of celebration to this one and our tribute grows. We are supporters of moms everywhere here at OPEAR, and would be delighted to hear your stories. Who are they? Our moms, our mamas, our mothers, our grandmothers, and aunties, and adoptive mothers, and mother-figures, and our foster moms, and our friend’s moms, and our dearly departed moms, and the women who raised us…I’m having a fit of nostalgia just thinking about all the things they did for me, despite all kids of odds, and these feelings are making me want to smile and melt in a puddle of tears at the same time. Where would we be without them? There’s also the moms we know as friends. My friends and I hid together in the library during school dances and giggled uncontrollably (we were little nerds, haha! ), and now I’m blessed to see them as moms. I see them raising their kids, and I am amazed at how awesome they are. I try to emulate them, and lean on them for support when I’ve had one of “those days”. They have patience and wisdom that you just never really could fathom as a 12 year old at a sleepover. They have the courage of lions, standing up for themselves, for their kids and families. I feel honored to call them friends. Let’s not forget the moms we’ve never met. The moms we see, either in public, or in the media, or in history…. The moms that are our role models without even knowing our names. The moms who take the time to teach their kids about sharing when they are on the playground, the moms who remain calm and polite even when their kid won’t stop screaming in the grocery store (Lord knows this isn’t me!! ), the First Ladies, celebrities, and public figures who raise gracious children, the single moms who work their asses off to provide for their kids, the moms who stand up for our human rights, and who teach us that love, not hate, is the answer to all the world’s ills. I am beyond thankful for them. Most of us will tune in to watch the opening of the Olympic Games today, but here’s one Olympian you should also tune in to watch, not only because she’s a world-class, cross-country skier, but also because she’s the only mom on this year’s USA Winter Olympics team: Kikkan Randall! Here’s a picture of her and her son from her webpage. If you are a fan of the Games, then you might have heard of Wilma Rudolph. She set world records and won gold medals in the 1956 and 1960 Olympic Games, the first Black woman to win three in a single games. You probably haven’t heard of her mom, though. According to her Wikipedia page, Wilma was the 20th of 22 siblings, and lost strength in her left leg and foot due to polio at the age of four. She and her mother traveled 50 miles away by bus to Nashville once a week (closest available treatment for African Americans at the time), in order to receive treatment, and received massages at home 4 times per day. She regained the use of her foot and leg by the age of 12, thanks to the tireless efforts of her mom and family. Talk about love, persistence, and self-sacrifice. Then, as if all that wasn’t enough, Wilma had her first child in 1958. That means she was a new mother when she was training for the Olympics in 1960. Unbelievable. Her job title is officially Athlete Services Coordinator, but she does so much more than coordinate the athletes, according to an interview from NPR. She serves as a shoulder to cry on, a source of inspiration, and tireless cheerleader of our athletes. Keep it up, Sherry! 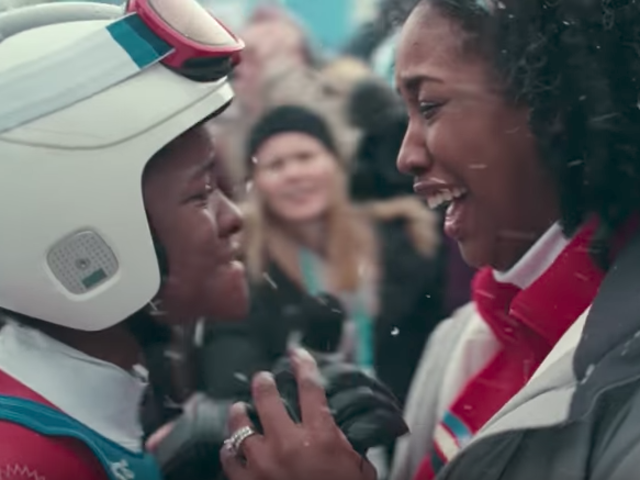 If you haven’t had a chance to watch the video P&G put together for this year’s Olympics as part of their #loveoverbias campaign… then just stop what you’re doing and watch. ALL THE FEELS RIGHT HERE. Want to give a shout-out to your mom, or another awesome role model? Please tell us your stories and tag the moms in your life that deserve to be recognized! Add your voice to the celebration! Reply to us on Twitter @_OPEAR or on Instagram @findopear or on our Facebook page. Strong Moms. May we know them. May we be them. May we raise them!